To celebrate the Super Moon Equinox plus our week of celebrating the Autumn Equinox I wanted to make a wonderful autumn meal. It is quite cool here already. I lost most of my garden to a frost about 3 weeks ago. So I wanted something warm to prepare us for an evening of moon gazing. 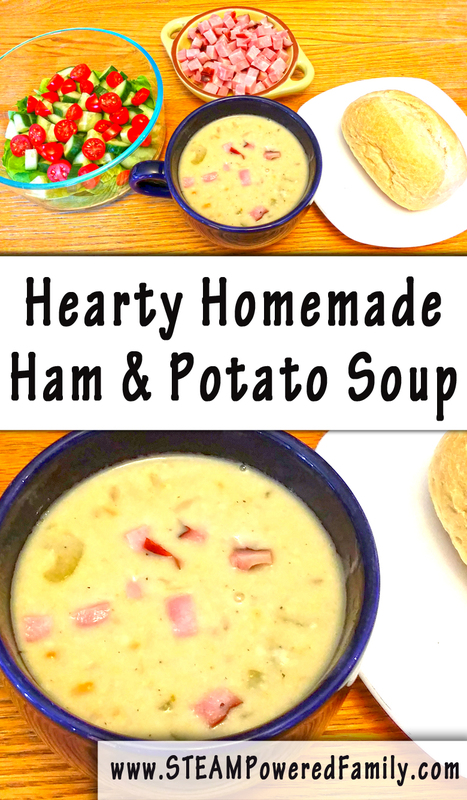 One of our favourite soups is Homemade Ham and Potato Soup and it was perfect for this occasion. To make this soup you will need some stock, I use my own homemade veggie stock and I really believe that is what takes this soup to the next level in flavour and health. It is not hard to make your own stock and it is a great way to cut back on waste and save a bit of money. You can find my recipe here. If you don’t have time to make your own stock, you can use store bought. I prefer veggie but this would work with chicken stock too. Diced Ham – I buy mine from my butcher so I know it is local and really good quality. In a large soup pot add the olive oil, onion, carrot and celery. Add a bit of salt and pepper. Cook on medium heat until the onion starts to soften, add the potatoes and ham, a bit more salt and pepper, and continue cooking. Until it starts to brown up. Add garlic (crushed), ginger (minced or grated) and curry. Heat through for one minute until garlic is fragrant. Add stock and stir to lift all the cooked on brown bits from the bottom of the pot (those are your yum bits!). Bring to a simmer and let simmer for 30 minutes. Stir regularly. At approximately 20 minutes add butter to a small pot and melt over low heat. Once the butter is liquid start adding flour a little bit at a time and stirring constantly until you have a paste. Now add your milk. Whisk constantly over medium-low heat until the mixture starts to thicken. Turn off the heat under the soup pot, then add the thickened milk mixture to the soup pot and whisk it all together. Serve with fresh buns for dipping and extra ham for those who like extra meat. I also served our harvest meal with a fresh salad. So delicious! 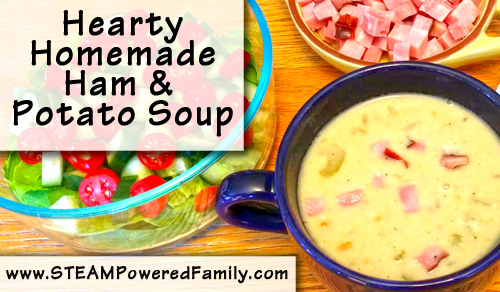 This soup always gets rave reviews. Did you see the super moon eclipse? This soup was perfect for filling us up and warming us up before a cold evening of moon gazing. How much stock? And… the moon was cloud covered here for a bit, but then broke through. I forgot to mention in my other post on the Legos for Beast Academy. The first chapter of 3A is not my favorite of the Beast books. I loved all of 4th grade though. Challenging, innovative, and high quality. Up here they sell it in standard sized cartons. I never thought of it as coming in any different quantities. I believe our cartons are about 1L. Hope this helps! 🙂 And thanks for all the great comments about Beast Academy. We are almost done Chapter 1 now. Thank goodness! It’s been a tough one.